One is our very clear motto, the (theoretically) best position with the best power transmission or the lowest air resistance is of no use if the athlete is physically unable to drive it, therefore the individually possible optimum is the goal. This can be somewhat limited by the physical conditions of an athlete compared to other athletes, of course, but it is better to make the best of your possibilities than to be slower with a copy of a professional position. In addition to basic measurements of physical dimensions, such as inner leg length, shoulder width, upper body length and others, we check the basics of physical requirements. This includes checking leg length differences as well as various tests to determine individual mobility. 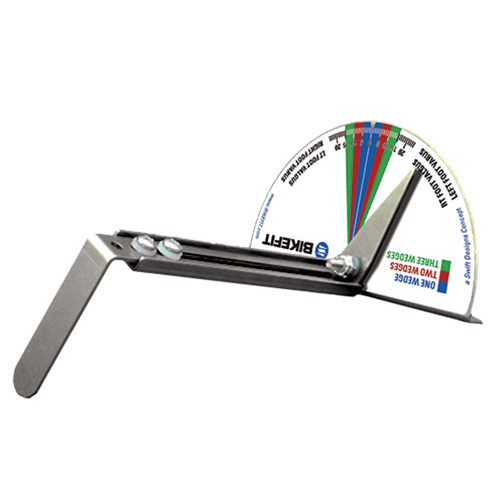 An examination of the wheel also helps us, certain signs of wear on the saddle or pedals clearly indicate certain problems. Then everything starts from bottom to top, so the contact person to bike, what means feet, shoes and pedal system, then we work our legs upwards. One thing is clear, almost no sportsman would nowadays buy running shoes to give an example from another sport without getting advice in advance, this is so to speak self-evident, right? If one considers now, which constantly repeating loads can occur while cycling, then it is only logical that also there corresponding problems can be the result. Not to mention the loss of power. The linked illustration shows this clearly, due to a malalignment, which, similar to running, can initially originate from the ankle joint, the entire leg axis no longer works optimally, the knees rotate outwards and inwards. This is explained again here. Loss of strength, one-sided loads and wear, possibly pain and possibly (permanent) injuries can be the result. More information here. An example calculation: You drive 100km in 3h 20min with a frequency of 90 rpm, thereby your knees deviate inwards and outwards at most 1.5cm each from a straight line. With a total deviation of 3cm (only one leg & at the place of the biggest deviation!!) there is 2.7m lateral movement of the leg per minute, at 100km !!! Just one leg, mind you. This also changes the pressure distribution of the foot, which can lead to the not uncommon symptoms of burning, aching or numb feet. In this picture you can see one of the most common places where athletes report pressure/pain (marked red), caused by the uneven pressure distribution. In the right figure we find an even pressure distribution. Back to the evasive movement resulting from a not completely straight position of the foot, this can of course also be measured in addition to observation of the travel movement and determination of the evasive movement. Even without technical aids you can make a first estimation, you can see this here, in the view from above you can see clearly that the foot surfaces are turned inwards and not against the ruler. 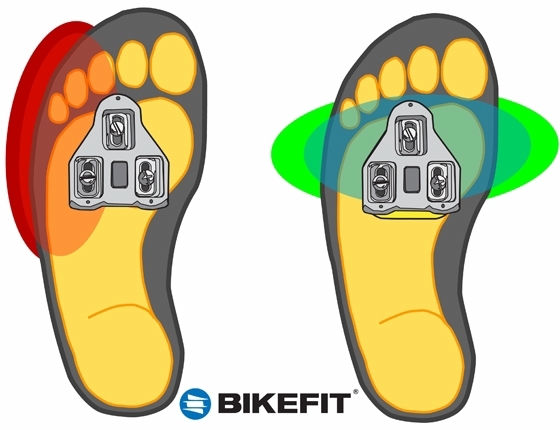 This angle can be measured exactly with a special tool, afterwards it is corrected to the individual needs under the shoe plate with a small wedge, you have already seen the difference in the above illustration on BikeFit.com. One can really say small cause big effect, by applying one or more wedges can be found for everyone the appropriate correction. 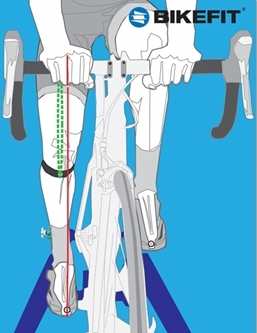 Corrections which should lead to a changed foot position or correction of the leg axis are never carried out in the shoe, in our opinion an optimal cycling shoe sits so that e.g. a tilting of the foot in the shoe can lead to subsequent problems, pressure points on the top of the foot would be an example. There is nothing wrong with a supporting insole, we are critical of a correction in the shoe. How we then objectively ensure that we find your position with the best power transmission, and can show you exactly what you win compared to your original position, or where you can find a mobile position in between, you can read here.